We all know as a Blogger I received Press Releases and offers of samples. 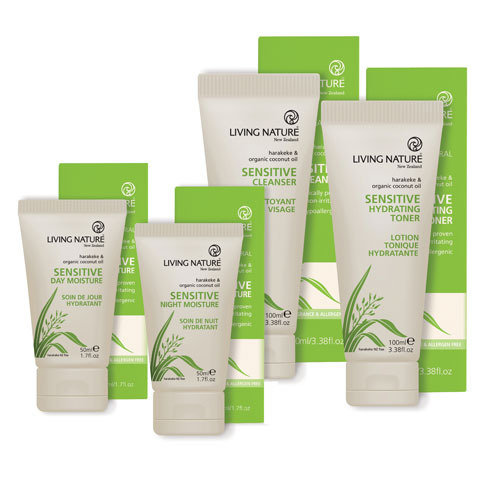 I was intrigued to hear that Living Nature has launched a Sensitive Skin Range which includes a cleanser, toner and day & night moisturisers. However, I ended up declining samples so let me explain why I am hesitant about this range. Firstly, I don't like the marketing message "Containing only the purest, certified natural ingredients and free of fragrance and allergens, this new face care range deeply hydrates, nourishes, protects, soothes and calms sensitive skin." Any skincare brand that claims to be "allergen free" is going to make me raise an eyebrow as surely any ingredient has the possibility to cause an allergic reaction in at least one person. However, on closer inspection I noticed these products contain Lactoperoxidase and this ingredient is an enzyme prepared from whey protein concentrate, derived from cows milk. When I declined samples based on the fact I have a milk allergy, I received an email in which Living Nature explains how this ingredient should not affect lactose intolerant customers. Let me state that I am always beyond frustrated that people are evidently confused between lactose intolerance and milk allergy. But moving on from this, below is an extract from the email I received. The milk ingredient that causes most of the allergies is a component called casein and not whey or its extracts. For this reason most individuals who are intolerant to whole lactose, will not suffer any intolerance to the whey derived enzymes, especially when applied topically. In their studies, no adverse reactions have been reported following topical administration of the whey proteins, despite some minor gastrointestinal disturbances that were noted when the enzymes were consumed – but only from individuals who had a very high intolerance to lactose. They quoted the reference study: Marshall, K., Therapeutic Application of Whey Protein. Alternative Medicine Review, Vol 9, No.2: 136-156, 2004. I have previously given my opinions about food allergens in skincare (click here and here). I'm not a scientist but when you have skin prick tests and see the reaction caused, in my case to milk, you do start to wonder about your skincare. It may be a minimal risk but it's one I chose not to take. Of course I am pleased to see another sensitive skincare range on the market and Living Nature is a trusted New Zealand brand. Most of their customer base will not worry about Lactoperoxidase but I wanted to make my readers aware. I also have a large Vegan following and this ingredient will not be suitable for them. For all my other readers, if you are interested in Living Nature’s new Sensitive Skin Range it is available from Botanical Brands and other online retailers including My Pure, Naturisimo, LoveLula* and Feel Unique.